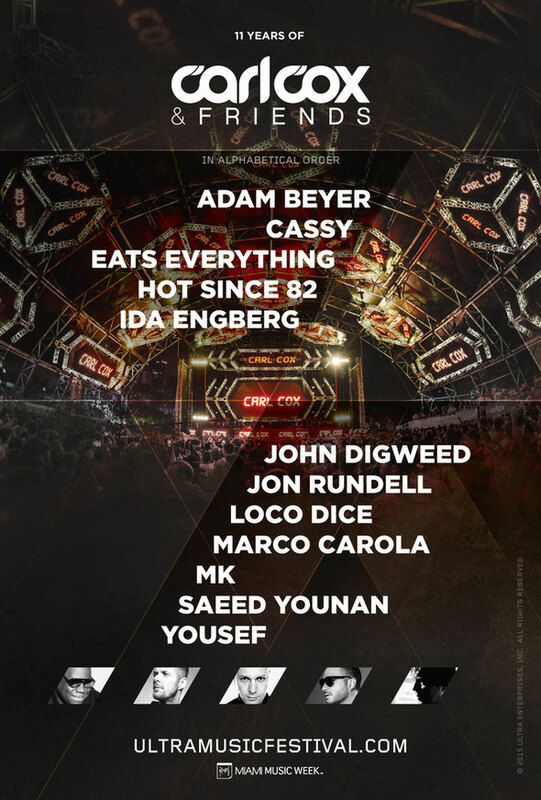 Carl Cox returns to the US for a series of dates this year with a crowning jewel being his 11th Carl Cox & Friends arena at Ultra Music Festival in Miami. Longtime supporters of one another, both Carl and the organisers of the festival work diligently to try and create unique, visually stimulating environments within each new inception of Carl Cox & Friends. This year shouldn’t be an exception. Talent on each of the CC&F’s lineups are curated personally by Carl to ensure a flow of energy throughout the day and into the night. Production values are at the epicentre of this arena as fans are submerged in an aural playground. Every attention to detail is seen to, aiming to ensure that fans, and those watching from home, get an experience they’ll possibly never forget. This year Carl and team have added another bonus to the mix, a live radio broadcast from the CC&F arena at Ultra on Saturday the 28th to celebrate 12 years of Global Radio (which is now syndicated in 88 countries and heard by 25 million listeners a week). The broadcast will air live on Mixlr.com and fans can follow mixlr.com/carlcox now for pop-up broadcasts featuring classic sets from the last 12 years of Global. The show will also air across some 30+ FM networks with more being added each day.